As we turn the page to a new year and companies set their agenda for 2018, there are continued and emerging trends in Human Resources and Benefits that will affect companies and their employees. Understanding these trends will help companies provide legally compliant policies and programs which address employee concerns and ensure a positive work environment. With the recent charges of harassment at the end of 2017, companies are going to be looking closely at their harassment policies and updating policies to ensure respectful workplaces. Part of that effort will be a push towards training all employees on the do’s and don’ts around harassment in the workplace. Companies will have zero tolerance when it comes to discrimination and will expect all employees to abide by the company policies. On the flip side, it’s likely there will be continued revelations around workplace harassment. Paid leave laws to supplement pay is on the rise. Many states have already enacted laws that provide paid time to address family needs such as maternity and paternity leave. These include California, Rhode Island, Washington, New Jersey, New York, and the District of Columbia. Other states have paid leave laws for sick time (Connecticut, California, Massachusetts, and Oregon). It’s likely that we’ll see an increase in these two different types of paid leave laws. The trend towards integrating the multi-generational workforce will continue in 2018. In the coming year there will be up to four generations in the workforce, with the younger generations making up the majority and holding more than a third of the managerial roles. Understanding the differences in the generations and in their interests and drivers in the workplace is paramount for a company’s success in this diverse workplace. Wellness programs continue to be on the rise and traditional programs focusing on exercise and weight loss are being expanded to include mindfulness and a more holistic look at wellness. Mindfulness has been proven to reduce stress and anxiety, while also increasing concentration and companies are continuously looking for ways to improve their employees’ quality of life. Wellness programs are also looking at improving the ergonomics of the workforce, as evidenced by the increase in standing desks and more mobile workplaces. At the end of 2017, the implementation of the Department of Labor’s (DOL) Fair Labor Standards Act (FLSA) increase to the salary threshold was blocked, leaving the current salary threshold of $23,660 in effect. It’s expected that a new threshold will be proposed in 2018 and it will fall somewhere between the current threshold and the Obama proposed threshold of $47,476. While a full repeal of the Affordable Care Act failed in 2017, changes to the healthcare law will continue into 2018. The new tax law, which recently passed, eliminates the individual mandate and undermines the original intent of Obamacare to provide healthcare to all individuals. For Massachusetts residents, an individual mandate under Massachusetts healthcare reform legislation remains active. All residents who are 18 or older must maintain health insurance that meets minimum coverage requirements or be subject to financial penalties. The GOP will likely try again to repeal and there will be further changes to how the ACA is administered. 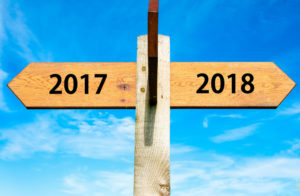 In addition to changes to the ACA, 2018 will see an increase in benefits that focus on the employee’s financial wellness, such as loan assistance, and a movement towards an increase in telemedicine. Companies will continue to move away from the annual performance review and move towards continuous performance feedback. In doing so, more employers will begin using an ongoing feedback system rather than a performance rating system that assigns a number to performance. Many companies are setting up more formal programs which incorporate periodic performance check-ins to provide ongoing feedback. In addition to these trends, expect an increase in HR technology and self-service as well as a focus on employee engagement and learning. Happy New Year and here’s to a great 2018!